Dance is the spoiled child of the large family of art. Of course, we are talking about those forms that take place intentionally before the eyes of the viewers. Dance as a form of performance, as an art medium cannot be written down; it cannot be grasped in any other way than in the moment of watching. If you miss it, you don’t have it. Dance requires space. And lots of time. Dance evaporates. It cannot be written down. Even though there have been some attempts to achieve it, technique gradually wins out over dance calligraphy. Dance is narcissistic and wants to show off. Dance is a spoiled art. It demands a lot from us. Contemporary dance has undergone development influenced by all of the dance genres that came before it. It is a vague and wide term, but so far no exact definition exists. In general, this term defines the last tendencies in the long journey of reactions to the departing streams. If we were to describe it very superficially and geographically according to the Euro-American world, the line of development would look approximately like this: classical dance, followed by the natural movement of Isadora Duncan, the analytical approaches of Rudolf Laban and Ingmar Bartenieff, the magic of jazz, the flying of Jose Limon, the mathematics of Merce Cunningham, the every day character of the post-Modern motion of Trisha Brown, the contact improvisations of Steve Paxton and his contemporaries, the release technique with various borderline therapeutic-motion techniques – including body-mind centring and the method of Feldenkreis and Alexander. So far, contemporary dance is probably the result of all of this. 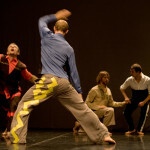 The history of contemporary dance in Slovakia is similar, except for the fact that the natural course of action was affected for a long time by period ideas regarding the necessity and functionality of art. Before 1989 people seeking new information travelled to Budapest, which was a bit larger and more welcoming to dance. New dance companies such as Alfa, Auriga, Allegro, Bralen and Alternatív were established and although they were officially classified as amateur modern dance groups this was where we encountered progressive and experimental dance work. Today only a few of them still exist; they were mostly transformed into smaller companies. The natural effort toward professionalisation took place – although the differences between professional and amateur dancers are not precisely defined even today. In any event, the above-mentioned companies fulfilled their role of starting from a place for something other than that offered by the classical epic ballet or the ballroom and Latin American dance clubs and folklore ensembles that were well supported by the regime in Slovakia. Moreover, those were the days of large cultural centres, which featured practice halls, stages and seating with standard technical equipment and efficient promotion departments. Probably the only problem was that experimenters had to toe the line, but in the event that someone occasionally ‘drifted’ ideologically, the literary illegibility of dance was suitable and metaphors could have whatever meaning. Until then, the place of modern and contemporary dance was clear. It was a real place – there were plenty of cultural centres – and a virtual-value-spiritual place too: amateur groups developing motion imagination and the aesthetics of youth. The political changes of 1989 opened up renewed possibilities for travel and information exchange with the surrounding world, creating new possibilities for contemporary dance. Various foreign foundations with foreign capital and foreign cultural institutions operating in Slovakia were of great assistance in acquiring new experience and information. Thanks to the direct confrontation with the European dance space, the logical unravelling of the route for many choreographers and dancers from ensembles then classified as ‘modern dance companies’ was professionalisation. In short, this meant the decision to become an equal partner with the established genres of stage dance art, which in the eyes of the general public still equates with ballet with its developed organisational structure (from education up to the final results in the form of performances). As such it should be said that that we are still only half way there in contemporary dance.